Food for Others: MSI's First Official "Giving Back" Event - Miklos Systems, Inc.
MSI’s Employee Ownership Committee (EOC) regularly attends employee-ownership events and conferences, often hosted by the ESOP Association or the National Center for Employee Ownership (NCEO). We get the unique opportunity to hear about how other employee-owned companies celebrate and share their employee ownership within their company and with those on the outside. One of the key ways they do this is by giving back to their communities. What a great idea!! 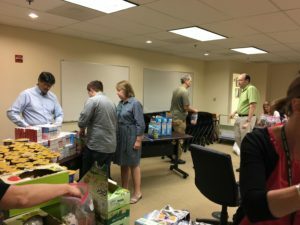 In support of our community, MSI’s employee-owners got together in May to package food pouches to support “Food for Others” P3 Program, a program to provide supplemental weekend power packs of food to Fairfax County children who may otherwise rely only on school-provided meals. The P3 Program has been quite a success, delivering over 62,000 power packs to 28 area elementary schools in 2015-16. The Employee Owne rship Committee purchased the food and supplies, and the event was on!! 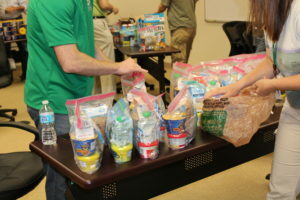 We gathered in the MSI conference room where the EOC had staged 650 lbs of food for packaging — YES, 650 LBS of juice boxes, chocolate milk, Chef BoyRDee, mac n cheese, cereal bars, pouches of tuna and chicken, fruit snacks, and more! Each power pack was to contain two items each for breakfast, lunch & dinner plus two snacks and two drinks…all neatly packaged inside a 1-gallon ziplock bag! We had work to do! Each person took a station and we formed an assembly line. Empty ziplock bags w ere filled first with Chef BoyRDee, then handed to the next station for chocolate milk, juice boxes, applesauce and mac n cheese. Next each bag got cereal bars, then tuna and chicken, then fruit snacks…then…well, you get the picture…until each bag was QA’d and sealed. Besides the people manning the stations, some folks were “floaters”, floating from station to station helping where needed. 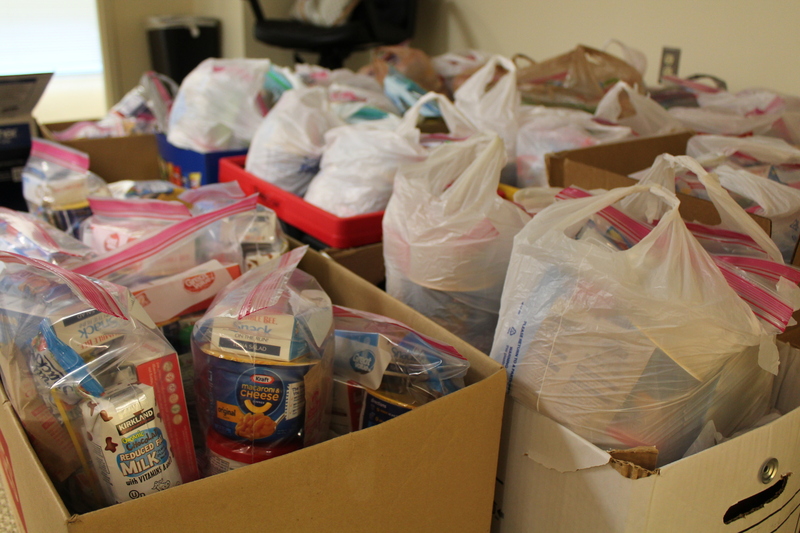 Others were responsible for bundling/organizing the gallon-size bags for delivery to the food bank. It was quite a production, and it worked flawlessly….nearly. At one point, we ran out of one of the food types so we had to invoke our agile skills to quickly figure out how to repack the bags with a different variety of food. It only took us two tries to get it right – LOL. Good thing we have a company full of engineers. 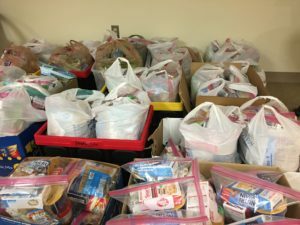 When all was said and done, MSI employee-owners packed 225+ P3 pouches in about 45 minutes and delivered it the next day to the food bank. It was a great experience working together for a great cause, connecting as employee-owners. Now there’s the spirit!